The web page load slow when there are ads on the loading page and the trackers violate users privacy. Up to 60% loading time takes to load ads and another 20% to load the trackers. The only way to get over the loading issue and protect your privacy is by using the Brave Browser. Brave browser blocks ads and trackers to provide fast browsing and protect users privacy. In addition to that, Brave integrates HTTPS Everywhere to its browser making your browsing secure. The application is provided by Brave and it is available for free in the Google Play Store with no In-app purchases. This application is previously known as Link bubble and it retains the bubbles feature making web pages load in the background. Browse faster, safer and better with the Brave browser. 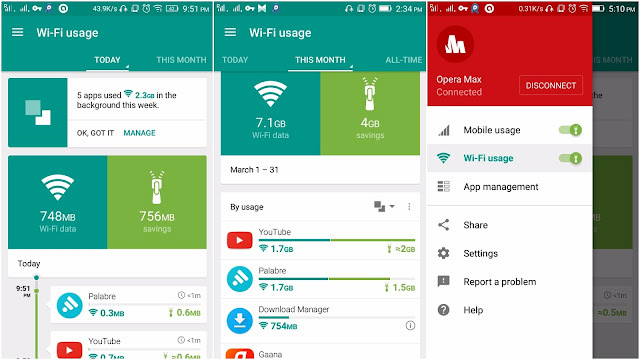 Opera Max is a data saving app that compresses web pages, images, videos and music on most of your applications either you are on a Mobile network or using WIFI. Using Opera Max you can save up to 50% data watching videos and 40% streaming songs. The app is offered by Opera and is available for free with no In-app purchases. When your apps are silently eating data in the background then the Opera Max alerts the users and a quick option to block them. Other than data saving capabilities of the app, the feature I liked is the timelines. The timeline shows a detailed list of mobile apps and the amount of data the app used along with the amount Opera Max saved. In the app management section, block the unwanted apps to access mobile data or WI-FI data or restrict them to use the data in the background. If you don't want the Opera Max to save data while using your favorite apps, whitelist the app. 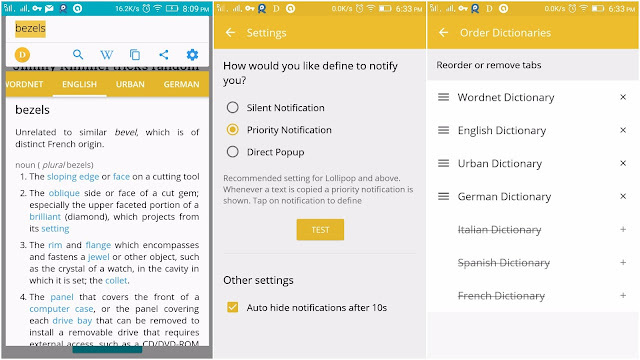 Define is a dictionary app that lets you know the meaning of words by copying the text inside any app and without leaving it. The application is built by Workarounds and it is available in the Google Play Store for free with no In-app purchases. Simply, Copy the word and its definition shows up in the notification bar. You can change how the notification appear in the settings. In addition to that, you can know the synonyms and usages. Great Day Readers! To give more insights into the application, Manideep, co-founder responded with answers. Here are the Q&A exclusively for our readers. We are four people and we used to run an app studio called Workarounds. Along with external projects, we also gave time to our own ideas like define. We were initially two (Myself and Madhu Kiran) and later Nithin and Chandra Mouli (part time) joined us. 2. What was your inspiration that leads to the creation of Define? Smigin is a language learning application available in the Google Play Store and it is the easiest, fastest way to speak other languages. The app is offered by Smigin for Free and with In-app purchases. Smigin is easy to use. Select the language that you are interested in learning and build your phrase in three steps. 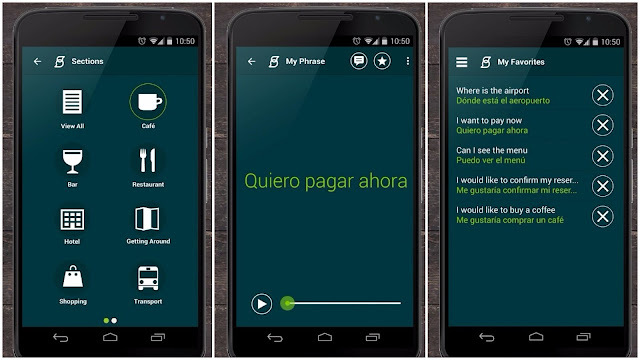 The language speaking app will display the translation and help you with the pronunciation. Save your most used phrases in your favorites. Commonly used conversations in the cafe, bar, shopping, transport, business, emergency and other places are included in the app. Simply build your phrase to start the conversation and don't worry about the grammar or spend time to learn from the start. Currently, Simigin supports Italian, French, Portuguese, Polish, Spanish, Swedish, Haitian Creole and more languages will be added in the future updates. Under Heroes is a simple tapping game with 2D pixel art. 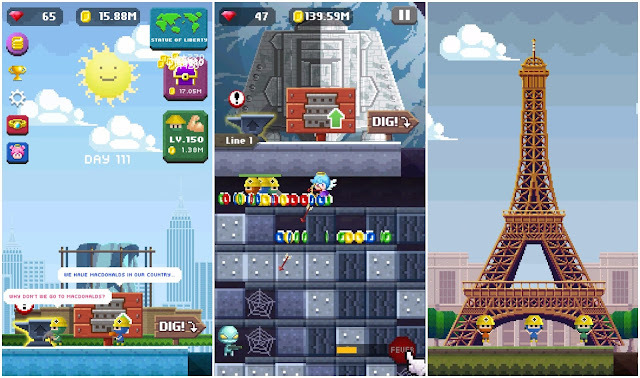 The game is developed by Nsouls and is available for free in the Google Play Store with In-app purchases. Digg to collect Gold, treasure boxes and hearts. Use the Gold to increase your strength and stamina. This will help you to dig deeper. The hearts can be used to increase your gold storage or get a pet. The pets are a new addition to the game. Three different pets are available and each pet will help you with the digging in a different way. Complete a level to build a famous Landmark in the region for a beautiful princess. There are 11 levels currently which mean 11 landmarks for you to build. More levels will be added in the future updates. Use the world map to view the landmarks you have built. The game is simple but addictive. I couldn't stop playing until I finish all the levels. 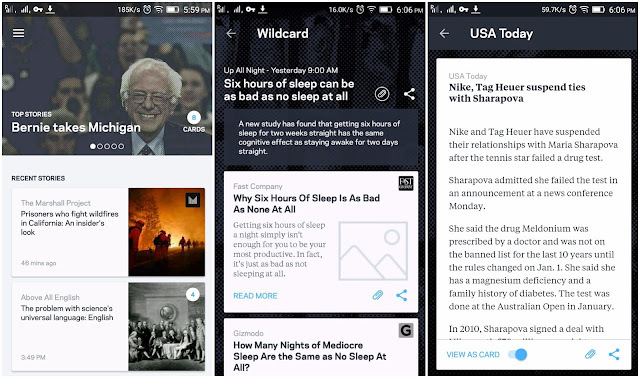 Wildcard brings curated news updates in the form of cards from various reliable sources. The application is provided by Coopkanics and is available for free in the Google Play Store with no In-app purchases. Similar stories from various sources are organized as cards showing summary. These summaries make easy for the users to quickly update themselves about the news stories especially when they are busy. You can read the news in detail and if you view the news as a card the loading time is negligible. The users can save the cards or individual news articles to read later. Great day Readers. Doug Petkanics, Co-Founder, and VP Engineering responded with the answers to give us more insights into the application and its development. MessagEase keyboard in an innovative and an alternate keyboard that is specially designed for speed and accuracy. The keyboard application is provided by Exideas and it is available in the Google Play Store for Free with no In-app Purchases. QWERTY keyboard has become the widely used keyboards for smartphones ever since Blackberry and Touch devices rolled out. Since then there have been many keyboards that appeared with decorative themes and colors but few are redesigning the keyboard itself. The smartphone and smartwatch keyboards are always limited by the screen space and its user’s wide fingers. Too many keys on the keyboard make it difficult for the user to precise the touch. This means the user ends up touching another key and MessagEase overcomes the issue. All the letters are placed in 9 keys. As its just nine keys, each key takes more space than a QWERTY. This is an effective way to use the limited screen space. 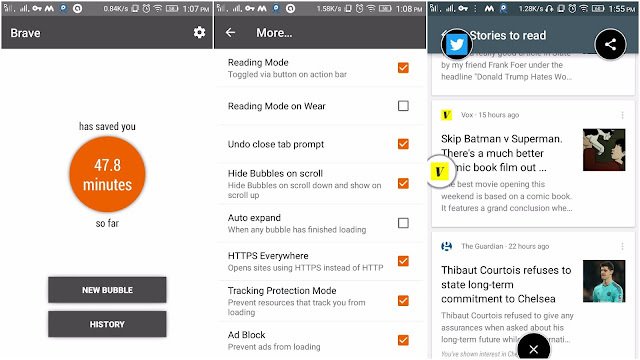 Corgi for Feedly lets you read news directly on your lock screen saving a lot of times for the news junkies who unlock the phone just to read the latest news. The application is offered by Corgi and is available in the Google Play Store for Free with no In-app purchases. How many times in a day you unlock your phone, open your news app and wait for it to load just to read the latest news that you've missed in the last few hours? Corgi for Feedly can be a time saver and saves you all the hassle. The user can choose Feed view or Magazine view. Feed view gives an overview of all the articles while Magazine view let you go through the stories one after the other. You can sign in to Feedly for personalized news feeds and sign into Instagram for customized wallpapers. To secure the phone from unauthorized entry, the user can set a PIN, Patterns and Fingerprint for the supported devices. You will have all the flexibility you would get using a default lock screen like controlling music.